NEW YORK - Mike D'Antoni shook his fists in the air as Jeremy Lin's clutch shot fell through the net. It wasn't just the basket that had D'Antoni giddy. It's the feeling that he's found the point guard who can get his offense running. "It's fun, you can actually draw a play up and (say), this might work," D'Antoni said. "So it was good." Lin scored a career-high 28 points in his first career start, Steve Novak added a season-best 19, and the New York Knicks overcame the absence of Amare Stoudemire and early loss of Carmelo Anthony to beat the Utah Jazz 99-88 on Monday night. "Basketball's so fun when you play on a team where people want to work together and work through tough times and overcome them and have victories like this," Lin said. "This one was ugly and we lost a couple of players, but this team has a lot of will." 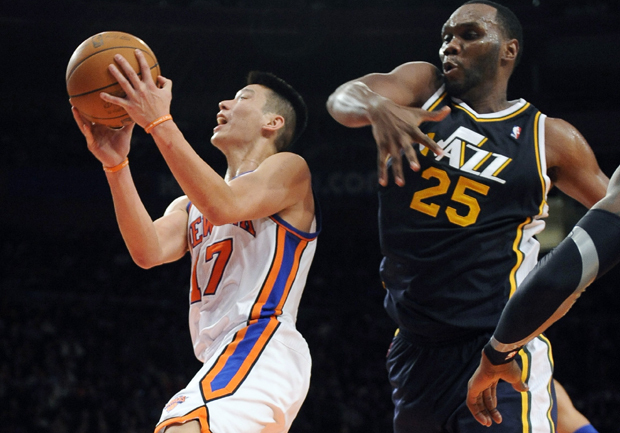 Al Jefferson scored 22 points in a disappointing effort for the Jazz, who may have lost their edge when they saw who the Knicks were missing. "As you seen out there tonight, you come in here with that attitude, you're in trouble," coach Tyrone Corbin said. "These guys can play, man, and they got pride. They get an opportunity to play and they make the most of their minutes. "They stuck it to us, really." He made the biggest basket of a game, a desperation 3-pointer with the shot clock winding down and 1:58 remaining that gave the Knicks a 95-86 lead. He previously converted two three-point plays in the period, the latter pushing the lead to 10 with 4:29 left. He did have eight turnovers, surely influenced by fatigue while playing 45 minutes, but D'Antoni was going to keep riding him. "I'm riding him like freakin' Secretariat," D'Antoni said. "It wasn't the starters out there but it was definitely guys that are aware that this is the NBA, where on any given night any five can beat any five," Novak said. "That's kind of an understood thing in the NBA. I don't think it will typically happen, that a team that has their starters against a team that doesn't will win. But I think tonight we just really pushed together, played well and were able to get the win." D'Antoni decided to start Lin, the first American-born NBA player of Chinese or Taiwanese descent, earlier Monday, and the position could be his for a while. Baron Davis, the expected starter when he becomes available, revealed that an infected right elbow had recently caused him to stop his workouts and it is unknown when he will resume practicing. D'Antoni said it would probably be a week to 10 days from the time he returns to practice to when he's ready to play in games. The Knicks led 19-16 after one, gradually increasing it to 37-22 midway through the second quarter as the Jazz simply couldn't get any offense going. Novak came on to play the final 5:06 and scored 10 points, with Lin driving into the lane and kicking it out to him in the corner for a 3-pointer with 27 seconds left that gave New York a 51-38 halftime lead. Jefferson grabbed only four rebounds in 35 minutes. Power forward Paul Millsap was limited to nine points on 3-of-10 shooting before fouling out. "We dug ourselves in a deep hole. You can't do that no matter who's on the floor," Jefferson said. "We're all professionals. Everybody is a pro. So no matter they didn't have their star player, they're still a team that you just can't go out there and take for granted. We dug ourselves in a deep hole and they got the momentum, got their confidence up and made shots." Tyson Chandler picked up his fourth foul and went to the bench about 1½ minutes into the third quarter, leaving the Knicks with a lineup of Lin, Novak, Landry Fields, Bill Walker and Jeffries. The Jazz capitalized and nearly caught all the way up, pulling to 75-73 with 45 seconds left on a 3-pointer by Raja Bell, who scored 11 in the period and finished with 15. NOTES: A half-dozen members of the Super Bowl champion New York Giants, including receiver Hakeem Nicks, were brought onto the court for an ovation during a second-quarter timeout. ... The Knicks held a moment of silence before the game for Hazell Stoudemire. The Knicks don't know when Amare Stoudemire will return to the team. ... Utah visits Indiana on Tuesday.